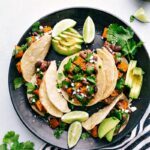 Roasted sweet potatoes and black bean tacos served with a delicious cilantro-lime sauce — these are the BEST easy vegetarian tacos! I was hosting a party last week where I had planned to make these amazing sweet pork tacos and then got a few late RSVPs from vegetarian guests. I had already bought a lot of the ingredients, so I still made the pork and then served it with a few extra veggie additions. 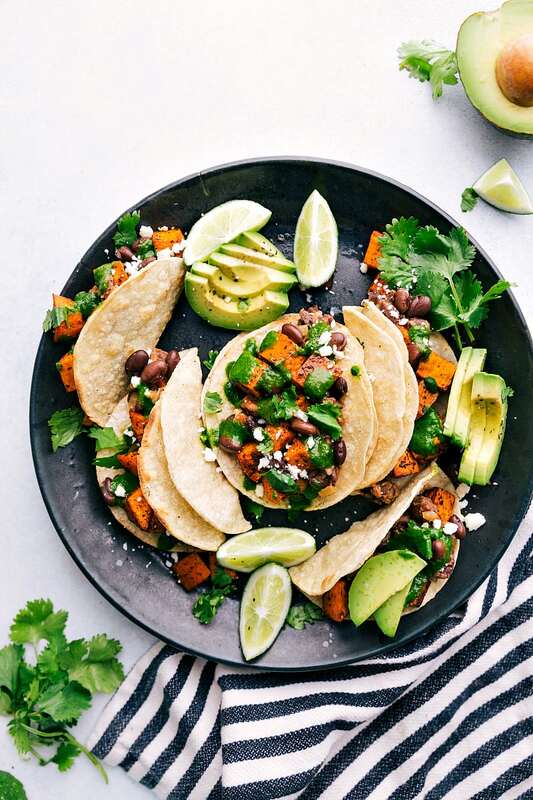 As everyone dished up and we created our own tacos (some meat-filled and some meat-less) these delicious vegetarian tacos with black beans were born and immediately obsessed over. Sweet potatoes: Peel and chop the sweet potatoes into bite-sized pieces. Toss the potatoes with olive oil and seasonings, then spread the sweet potatoes evenly on a sheet pan. Cook for about 20 minutes, then mix them around and cook for an additional 5-10 minutes. Dressing: The dressing is as easy as it is delicious! Simply put all the ingredients (except the sour cream) into a blender until combined and smooth. Then pulse or whisk in the sour cream. Taste and adjust to your personal preferences, adding more salt/pepper, garlic, etc. Tortillas: While you can also warm up your tortillas in the oven or on a skillet, if you have a grill, I would recommend grilling them. See below in the post for more information on how to grill your tortillas to perfection! Cheese: I prefer queso fresco or feta, but a sharp cheddar would also be delicious. Fresh lime: I usually cut a few limes into sixths. This allows people to squeeze as much or as little lime onto their black bean tacos, depending on how much of a citrus kick they’re looking for. Fresh cilantro: I get a small bunch of cilantro (you can use what’s left from making the dressing) and cut off the stems and it’s ready to go! If you prefer smaller bits of cilantro, you could also chop it up into small pieces that you can sprinkle on. Fresh avocado: This gives these roasted veggie tacos an extra creamy element that is absolutely delicious! 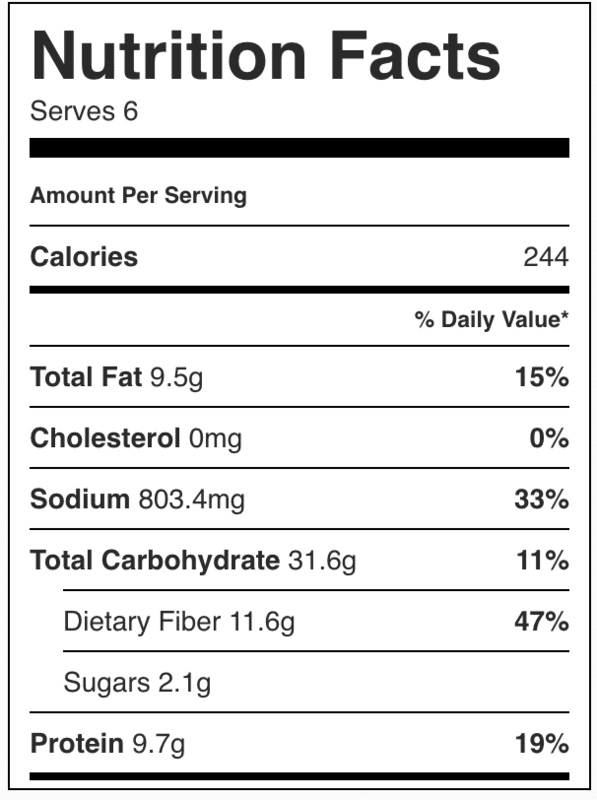 Sour cream: Use low fat or fat free sour cream if you’re looking for a lower calorie meal. Get 4 equal-sized meal prep containers, and 4 extra-small containers for the dressing. (You’ll want to store the dressing separately to avoid the tacos getting “soggy.”) You can buy bulk dressing containers, use tiny (dressing-sized) Tupperware containers, or even use small snack-sized plastic bags. Keep the taco “fixins” separate. Keep the tortillas (replacing tortillas with rice may be better for meal prepping), limes, and cheese portioned separately from the containers. Prepare the avocado fresh each day. 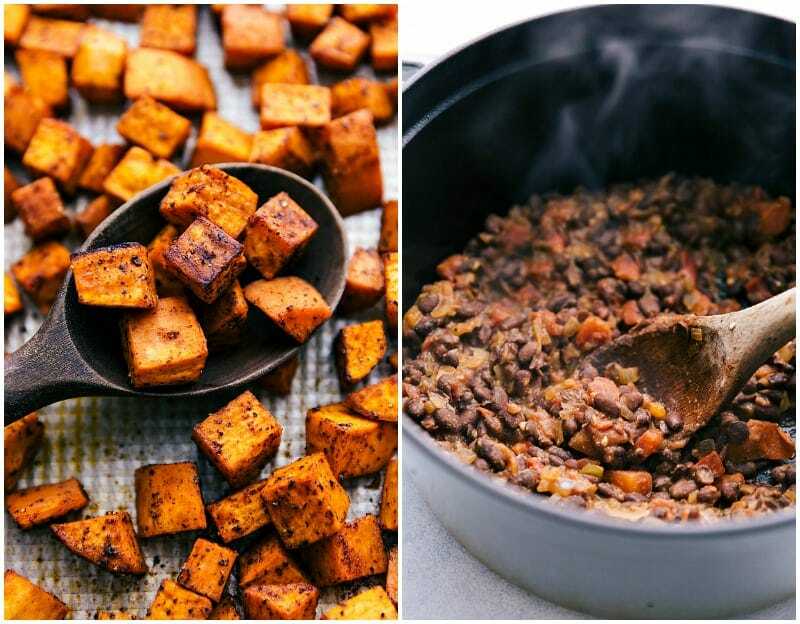 Your meal prep should look something like this: Black beans on the left, sweet potatoes in the middle, and the dressing in a separate container on the right. Next to the dressing you could place your toppings (each of which should also be kept separate from one another using snack-size plastic bags). The tortillas can be placed on top (inside the container if there’s room or outside if there’s not) and should also be kept in their own plastic bag. If you choose to replace the tortillas with rice, you can place the rice directly underneath the black beans and sweet potatoes. An easy and fun why to switch this meal up is to serve it over rice. I especially like this options when meal prepping! Another way you can switch it up is by using different dressings. I personally like the one I have in the recipe best (2nd photo; dressing on the left), but the dressing in the taco pictures were also a crowd favorite! The dressing in this recipe is super creamy and delicious, and the recipe in the taco pictures is a healthier, good-for-you dressing that is still equally delicious and easy to make. 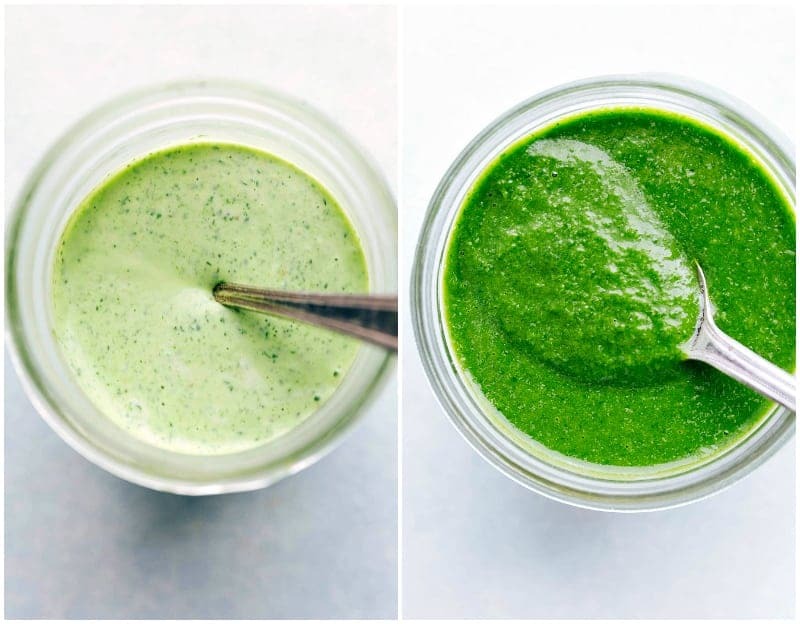 Here’s the cilantro-lime dressing recipe as an alternate to the one shared in the recipe box: 1 roughly chopped shallot, 2 cups tightly packed fresh cilantro leaves, 1 teaspoon minced garlic, 2 tablespoons red wine vinegar, 1 tablespoon fresh lime juice, and 1/2 cup olive oil. Add all the ingredients except the olive oil and pulse in a blender until combined. Once it is all combined, add olive oil and pulse once quickly until combined. (Over mixing olive oil can create a metallic taste, so it is important to add the olive oil in last.) Season to taste with salt and pepper (I use about 1 teaspoon salt and 1/4 teaspoon pepper). Spray both sides of the tortillas with cooking spray, lightly sprinkle with salt, and then place on the grates for 30-45 seconds, flip and leave on for another 30-45 seconds. Remove and immediately fold into taco shape and set aside to slightly cool. And if you’re looking for the BEST chicken tacos ever (obviously, not vegetarian) these are them! Street Size corn or flour tortillas OR skip the tortillas and serve over cilantro lime rice! Preheat the oven to 425 degrees F. Peel the sweet potatoes and chop into bite-sized chunks. Toss the potatoes with 1 teaspoon chili powder, 1/2 teaspoon paprika, salt and pepper (I use 1/2 teaspoon of each), and 2 tablespoons olive oil. Toss and spread evenly on a sheet pan. You don't want potatoes overlapping each other or they'll steam instead of roast, so use 2 sheet pans if needed. Place the potatoes in the oven for 20 minutes. Remove from oven, toss around and return for another 5-10 minutes or until crisp tender. Meanwhile, prepare the beans. In a medium saucepan, add the remaining 1 tablespoon olive oil. Add in the chopped onion and saute for 3 minutes over medium high heat. Add in the garlic and stir for another 30 seconds. Add in the drained and rinsed black beans, salsa, remaining 1/2 teaspoon chili powder and cumin. Simmer mixture for about 5 -10 minutes, stirring occasionally. Slightly mash half of the beans if desired. Add 1/2 a jalapeno (a full one for more kick) and the mayo. Add some seasoned salt and pepper to taste (I use around 1/4 to 1/2 teaspoon of salt and 1/8 teaspoon pepper). Whisk or blend in the sour cream. Store in the fridge until ready to serve over the tacos! To make the tacos: grill or warm the tortillas (see post for how to grill tortillas) and top with the black bean mixture, followed by the roasted sweet potatoes. Add the sauce and any other additional toppings: fresh lime juice, additional fresh cilantro, and fresh avocado! Add cheese to the tacos if desired. Enjoy while hot! *We made these tacos with the choice of two dressings (see 3rd picture in the post). Everyone loved both dressings, but the one I'm sharing today was the winner! If you want to make the dressing pictured on these tacos (the dark green one), you can find that alternate recipe in the post! This is my kind of taco. I don’t mind meat, but this is a perfect combination for me! 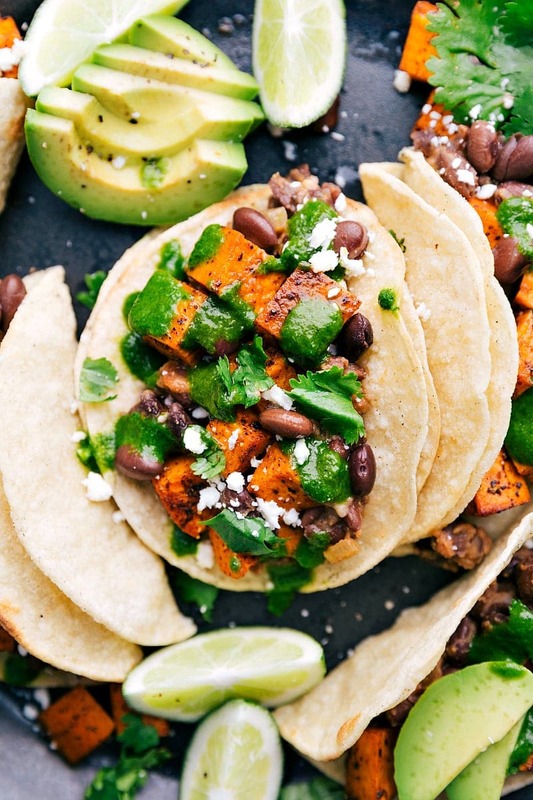 Sweet potatoes are perfect in tacos, plus as long as there are beans, cilantro, tomatoes or salsa, some creaminess, avocados… who misses meat?!! They’re so good! 🙂 Hope you love them! So happy to hear that! 🙂 Thanks for the comment Julia!